17 years! What our anniversary plans are. 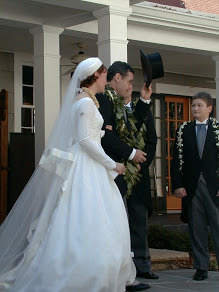 Seventeen years ago, I married Robert Kowal on the front porch of my parents’ house. I wore my mom’s wedding dress and we both had leis that his parents had brought from their home in Hawaii. We were worried about the wedding date because he’s a winemaker and there’s the pressure of harvest. We just made it. In fact, in close-ups of his hands, you can see the Pinot Noir stains in the creases. We had rain contingency plans, because it was an outdoor wedding in Tennessee in November. I was hoping for upper fifties and overcast. We got incredibly lucky. It was seventy degrees and sunny. The next year my folks reported torrential rains. Last night, I got back from a week of travel. 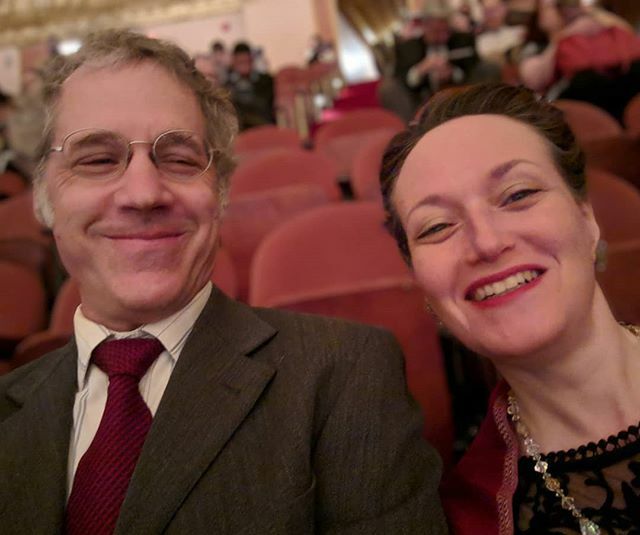 We went straight to the opera where we saw Siegfried as the first of our celebrations. Today, he’s gone to the winery because harvest was late this year. It’s snowing outside. I’m going down to the winery with my laptop and writing while he makes wine. My internet and phone will be off all day. Tonight we’ll probably go out for cocktails, then come home to cook and sit by the fire. The only two things that are consistent are that his hands are stained with Pinot Noir and we are as derpily in love as we were seventeen years ago. At first I thought you misspelled ‘deeply’. But ‘derpily’ is a much better word. Congratulations! And harvest and crush are kind of nonnegotiable, totally understand. Huzzah for seventeen years of derpy love! Given that most of what I know about wine is that I know if I like a particular one or not, I’m sure there’s all sorts of things involved in the timing of harvest and whatnot that is basically non-negotiable. So let’s hear it for that lucky year you had as far as timing goes. I love how you describe your marriage, and I also loved how you described marriage in your most recent books. THANK YOU for showing the world that a marriage can be healthy and happy instead of full of endless drama. It really resonated with me!